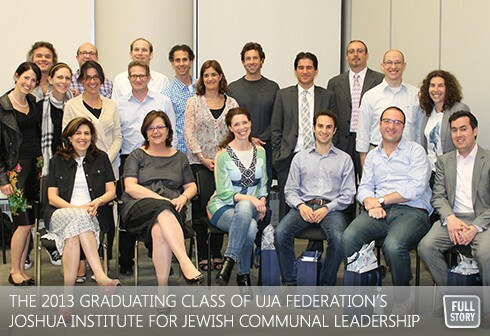 By Daniel Horowitz--On June 13, 2013, a new group of Jewish Toronto’s leaders emerged as part of the fourth graduating class of UJA Federation’s Joshua Institute for Jewish Communal Leadership. The Joshua Institute, which partners with the world renowned Rotman School of Management Executive Programs at University of Toronto, first opened its doors in 2009 to ensure that new Jewish leadership is cultivated and prepared to take on any new challenges facing Jewish Toronto. The unique and innovative program not only trains future leaders, but recruits, tracks and places the best and brightest of our community in a number of Jewish Toronto’s leading agencies, schools and synagogues, to ensure that these organizations flourish under those new leaders. The unique curriculum integrates Jewish values, learning, and social responsibility, and participants work with world class faculty and experts who will cover issues such as strategic planning, board governance, financial literacy, effective communication and media training, fundraising and strategic philanthropy. “The Joshua Institute is critical to the strength of UJA Federation and its network of agencies and organizations,” said Eileen Silver, Outgoing Chair of the Institute. Congratulations to the graduates of UJA Federation’s Joshua Institute 2012/13, listed below. Justine Apple, Stephen Arbib, Jordana Bergman, Gary Berman, Jamie Davis Dani Cooperman, Shirin Ezekiel-Hayat, Brian Ginsler, Rebecca Goldfarb, Rick Goldberg, Romm Gurel, Wendy Kauffman, Stephen Libin, Ryan Peck, Evan Pilz Avi Pollock, Daniel Rethazy, Naomi Rifkind Mansell, Jordie Saperia, David Silber Leah Silber, Jeffrey Silver, Shawn Stern and Zev Zlotnick. It is with great sadness that we announce that a participant of this year’s Joshua Institute, Elana Waldman, a greatly respected leader throughout our community, passed away on June 4th, following a long and courageous battle with ovarian cancer. For more information, please contact Robin Gofine, VP, Strategic Community Planning and Engagement and Director of the Joshua Institute at 416.631.5832 or at rgofine@ujafed.org.